No lie, when I first hear about paper piecing or English Paper piecing, I thought it was putting paper together to make a picture, like a puzzle. 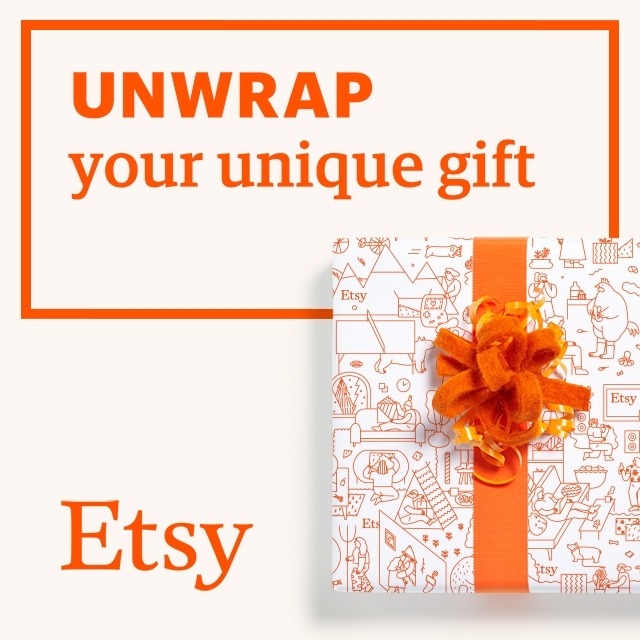 Which sounds neat in itself (and I may still try that out as an idea), but when I learned that it was actually a quilting method, I was intrigued and put off a little. This month’s challenge was a heavy craft. However, I wasn’t really inspired by anything I found. And, I didn’t really have the proper supplies on hand and I’m still sticking with my resolution to use supplies I already have on hand. I opted to try out a project I’ve been researching for a couple of summers now: paper piecing. Paper piecing is a method of quilting where small or complex pieces of paper are used to form a quilt block. You take a printed copy of the design you are making and working in numerical order, sew each piece together. This post is in no way going to be a tutorial, I have much more to learn about the process. Most people print out the pattern with a printer, however, we don’t have a home printer. I used my Silhouette to draw out the pattern for me! The best part of paper piecing is that you use up all those fabric scraps saved from previous projects. I’m sure I used more fabric that necessary when sewing my block together. As I learn, I’m sure I’ll become a better judge of what sized fabric pieces to use. I chose the easiest pattern (that was still cute) to make for this project. I found a spool of thread. This block also happened to be all one square rather than done in sections (I’ll try one of those next). I’m also quite proud that I only had to rip out one seam! Once you finish sewing all the pieces together, they will be sewn to your pattern paper. This means you get to start the best part, pulling the paper off. It was very satisfying to pull all those pieces off. While I enjoyed that paper piecing, I think I need some practice on the actual quilting of the block. I certainly need to work on the binding. Overall, I am pleased with the project and can’t wait to try out more paper pieced blocks. I had grand plans for Valentine’s Day. Had being the key word. I wanted to make a special dinner. There was going to be dessert (desert?, I can never remember). I also had a couple of gifts I wanted to create. In the end, we ordered Chinese take-out and watched a movie on Netflix. I guess that’s what happens when you both work very long days. I’m fairly certain we did something special over the weekend, but it’s not quite the same. One of the first projects I completed is one of my Valentine’s Day gifts. I found the idea from The Boy Trifecta. It’s a wonderful blog with lots of boy friendly ideas. These ideas often translate well into things I can make for my tech geeky boyfriend. Such as this shirt. Emily (I hope she doesn’t mind me using her first name as if I know her), made the design for her Silhouette. Then she was marvelous enough to share it with anyone who asked. This was my first non-paper project using my Silhouette. I had planned on using a sheet of stencil plastic to cut the design into. 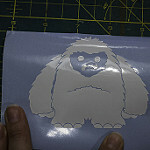 That plan was going well until the plastic sheet slipped on the cutting mat and the cuts got all messed up. I think next time I’ll not use the cutting mat (I learned after the fact this is possible). My back-up plan involved transfer paper. I thought was for such a purpose. Turns out it’s really for transferring vinyl designs onto their final destination. Who knew? 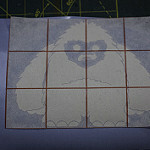 However, the grid side is just the right amount of sticky to work perfectly as a stencil. I believe I set the blade to 1 or 2 (I should take better notes while doing projects). The stencil came out wonderfully. I did edit the pattern a bit, I took off the bottom line that said nerd love. My boyfriend likes a bit of a mystery with his t-shirts. I placed the stencil on the shirt, doing my best to center the design and making certain it wasn’t too high. I could have measured and been more scientific about the process, but I eyeballed it instead. I don’t know if you have been fabric paint shopping recently, but it is really expensive these days. Plus I didn’t find a color I wanted. I settled on using Folk Art Acrylic Paint in a bright yellow. I’ve used acrylic paint on fabric before with good results. It fades a bit after a few washes, but it doesn’t flake off or wash out. I also swear I have foam brushes in the house somewhere, but the state of my craft room has them well hidden. I found this brush in our everything drawer in the kitchen. While I was painting, I made certain to put on an extra thick coat. Some of the paint is going to soak into the t-shirt material. Following the first coat, I went back over the design with another coat. I didn’t wait for it to dry, I just added a bit more paint. I did make sure to let the paint dry for about an hour before carefully peeling off the stencil. Because I wasn’t super careful and did paint the paper as well as the shirt, I wanted to be extra careful in peeling off the stencil paper. I didn’t want any paint to come off with the stencil. If I had been super romantic, I would have taken the time to wrap the shirt before my boyfriend came home from work. Instead, I left it on the newly cleaned off kitchen table. I think he enjoyed the surprise. I even caught him googling the code to discover the meaning. The confirmation that he likes the shirt was him wearing it to work just a couple of days later! And then discovering that he posted a photo to facebook!